Today I’m finally trying my very first DaivdsTea. I’ve known about this Canadian staple for a quite a while now, and admittedly I probably could have reviewed something of theirs when i was in Toronto a year and a half ago, but i failed to. Gold Rush was one of the first DavidsTeas to grab my attention. It looks cute and smells cute and has cute ingredients. ;p An organic White, Gold Rush, or ruée vers l’or, is actually more tisane than tea: made up of huge mulberries, vanilla cream coated coconut and Silver Needle, Gold Rush isn’t typically what you think of as tea. That being said, it’s very cute. In aroma, Gold Rush is mainly made up of roasted coconut and vanilla frosting (so very sweet). 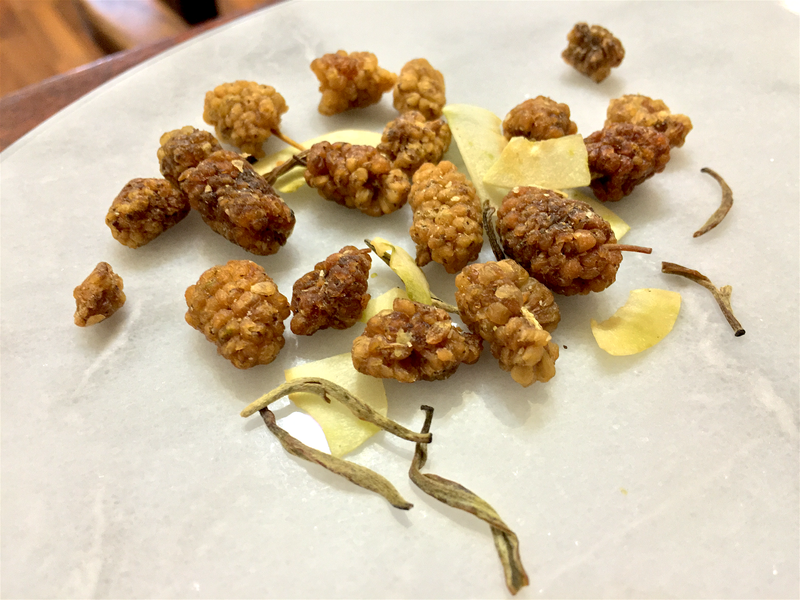 In flavor however, the mulberries dominate–tickling the throat with a bit of fruity sweetness. The coconut, of which there is a lot, tends to control the texture, resulting in an extra-tingly mouthfeel. Obviously there is Silver Needle White tea leaves in this mixture, but they really do little except to prop up the vanilla flavor (and add fur to the already tingly texture). From the sheen on the top of the liquor, i’d say there’s probably not a lot i can do to in adding tea leaves to balance out the fruit in this tisane. It’s… a lost caust. Fool’s gold. I’m probably giving it too much credit. It is a cute idea though, and it works moderately well i guess. Not really my thing, but if like exotic, fun tisanes you should go for it. Gold Rush (DavidsTea) ~ loose leaf by Jocilyn Mors is licensed under a Creative Commons Attribution-ShareAlike 4.0 International License. Gold Rush (DavidsTea) ~ loose leaf Macro by Jocilyn Mors is licensed under a Creative Commons Attribution-ShareAlike 4.0 International License. Gold Rush (DavidsTea) ~ spent by Jocilyn Mors is licensed under a Creative Commons Attribution-ShareAlike 4.0 International License. Gold Rush (DavidsTea) ~ liquor by Jocilyn Mors is licensed under a Creative Commons Attribution-ShareAlike 4.0 International License.